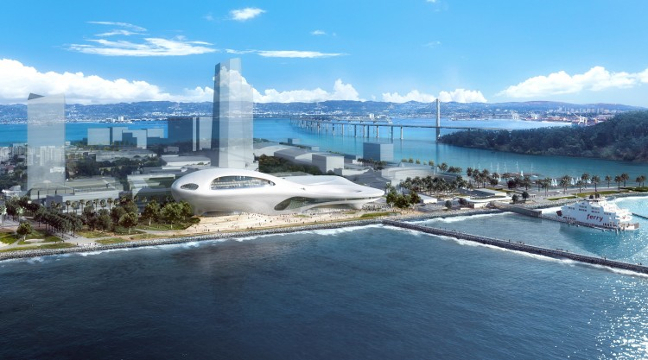 After the Lucas Museum of Narrative Art announced to leave Chicago in June, the museum released the competing designs by MAD for both San Francisco and Los Angeles. Both are arranged with expansive second-floor gallery and exhibition spaces that are lifted up on massive piers that allow for park and pedestrian areas to stretch underneath each complex. The first is for a site on Treasure Island, in San Francisco Bay. The second is for Exposition Park in Los Angeles, where it would sit near the Natural History Museum and Coliseum. Both designs lift the galleries up off the ground, allowing space for pedestrians to walk underneath. 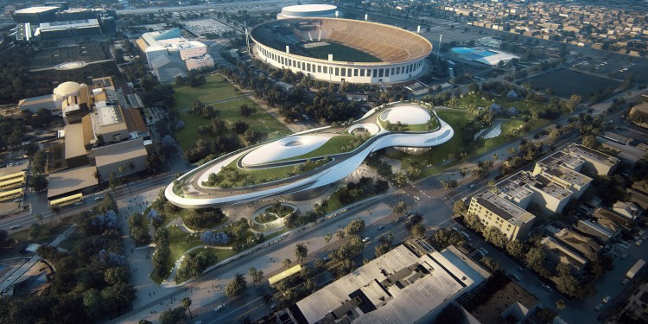 MAD first unveiled its design for the Lucas Museum in late 2014, when it was working with Chicago-based Studio Gang. The Luca’s museum of narrative art intends to celebrate the power of visual storytelling through painting, illustration, photography, film, animation, and digital art. the ‘barrier-free museum’ seeks to remove artificial divisions between ‘high’ art and ‘popular’, allowing future guests to explore a range of storytelling techniques, and welcoming a wider range of visitors. more details on the project will follow at a later date.